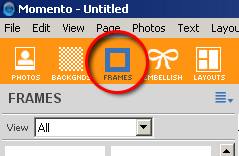 The Frames Panel is on of five Content Panels available in Layout View, Sort View and Cover View. The Frames Panel displays all the pre-designed frames Momento has made available in the software so you enhance any or all of your photos. As you would expect, the frame is a graphic that can border or decorate the edges of any photo. There are hundreds of frames available in the software and for download in Packages via the Updater Panel. Here are just some examples.